The Knights Brigade consists of a Marching Band and Color Guard in the fall, which perform at all home football games and participate in parades, festivals and competitons in the Bay area. 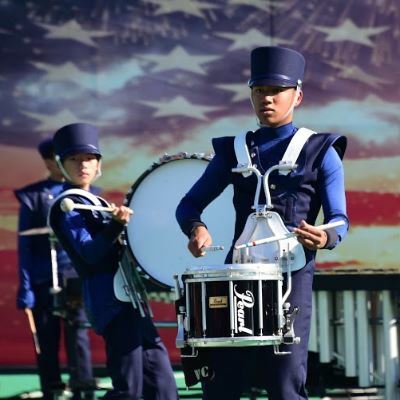 In the winter, our award-winning percussion ensemble and Color Guard competes throughout northern California. Check out the Knights Brigade webpage! This class is open to 7th through 9th grade students who play one of four orchestral string instruments: violin, viola, cello, or double bass. This orchestra provides performance experience for intermediate string players. Students learn how to make music as an ensemble. The King's Strings is an advanced level performance group open to musicians of stringed instruments in grades 7-12. This group plays in all three of our major concerts each year, participates in Solo and Ensemble contests, and performs in the pit orchestra for our senior high musical. Physical Education Waiver for Visual and Performing Arts Students – For students who intend to participate in Visual and Performing Arts Dance courses, The King's Academy will make available a waiver for one (1) semester of Physical Education during the 9th - 10th grade years to allow for continuity in VPA courses. This waiver will be available each year during 9th - 10th grade if the student is enrolled in a World Languages course. The waiver is applicable at The King’s Academy only and is not transferable to other schools, should the student transfer. The 6th grade Blue Band meets four days a week and is a yearlong course. It is designed to be an introduction to participation in concert band. Students will develop music reading skills on a band instrument and will be prepared for participation in the junior high Gold Band. Students who choose to be in the Blue Band take band classes instead of P.E. Note: Class fees apply. The class is designed for junior high students with intermediate to advanced performance level. Students will incorporate easy- to medium-level literature in their repertoire and will perform publicly each semester. Students will be required to own or rent an instrument for this course. For percussion students, school owned equipment is available. Students will need to own their own drumsticks and mallets as well as a practice pad. Prerequisites: Successful completion of Blue Band or teacher approval. Students must be able to read music. Note: Class fees apply. The class is designed for students with intermediate to advanced performance level. Students will incorporate medium – difficult level literature in their repertoire and will perform publicly each semester in field show competitions, school sports rallies, pep band and concerts. Competitions will be included in the schedule as well as playing at sporting events. Students will be required to own or rent an instrument for this course. Prerequisites: Successful completion of Gold Band or teacher approval. Students must be able to read music. Summer band camp is required. Notes: Admission is determined by audition. Class fees apply. Meets UC eligibility. The class is designed for students with intermediate to advanced performance level. Students will incorporate medium – difficult level literature in their repertoire and will perform publicly each semester in field show competitions, school sports rallies, pep band and concerts. Competitions will be included in the schedule as well as playing at sporting events. Students will be required to own their own practice pad, mallets and drum sticks for this course. Prerequisites: Successful completion of Gold Band or teacher approval. Students must be able to read music. Summer band camp and drum camp is required. Notes: Admission is determined by audition. Class fees apply. Meets UC eligibility. This class is open to 6th grade students who play violin, viola, cello, or double bass. It provides an opportunity for 6th grade students who already play a string instrument to continue playing and be better prepared to enter the String Ensemble or String Orchestra their 7th grade year. Students will be required to own or rent an instrument for this course. Students in Strings 6 will not take P.E. Prerequisites: Some prior experience with chosen instrument required. Note: Class fees apply. This class is open to 7th through 9th grade students who play one of four orchestral string instruments: violin, viola, cello, or double bass. This orchestra provides performance experience for intermediate string players. Students learn how to make music as an ensemble. Repertoire will include arrangements of music for string orchestra representing various periods and styles. Students will be required to own or rent an instrument for this course. Prerequisites: One year or more previous ensemble experience and weekly private lessons are required. Note: Admission is determined by audition. Class fees apply. This orchestra provides performance experience for advanced string players who play one of four orchestral string instruments: violin, viola, cello, or double bass. Students will perform a range of moderate length orchestral works, symphonic movements, and concert pieces at least twice per semester. This course may be repeated for additional credit. Students will be required to own or rent an instrument for this course. Prerequisites: Previous string instruction and teacher approval. 7th and 8th grade by audition. Note: Class fees apply.